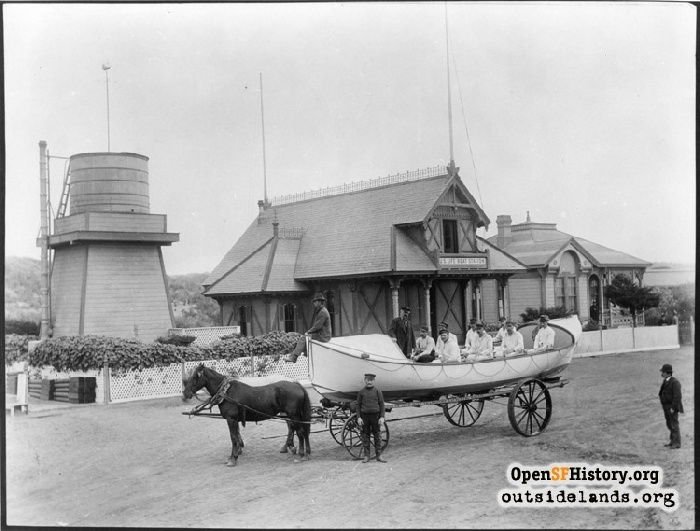 From 1878 to 1951, the predecessor agency of the U.S. Coast Guard had a station at Ocean Beach. 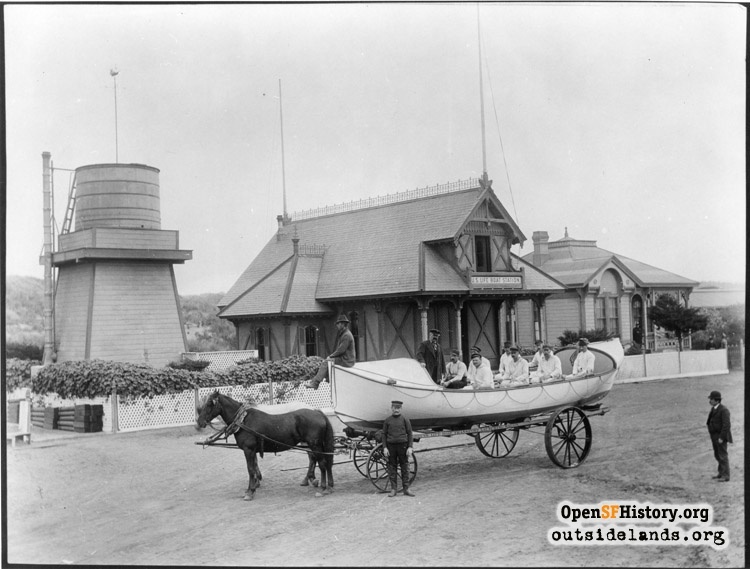 Few people know that Golden Gate Park once had its own Lifesaving Station. Not for park visitors, but rather for coastal steamers and sailing ships that found themselves in harm’s way along Ocean Beach and the cliffs of Lands End. Before the 1870s, ships that wrecked along America’s shores were essentially on their own. Except for local citizen efforts, there was no centralized, professional lifesaving agency in the country. To fill this critical need, Congress created the United States Lifesaving Service in 1871. Before long, Lifesaving Stations began to appear along coastlines and lakeshores around the country. California’s first station was the “Golden Gate Park Lifesaving Station,” located at the corner of Fulton Street and Great Highway in 1878. Crewmen lived at the station and were ready at a moment’s notice to effect a rescue of crews and passengers. The lifesavers relied on two primary pieces of rescue equipment: beach carts, containing a complicated assemblage of ropes and pulleys for firing a lifeline to a stranded vessel and rigging ship-to-shore rescue slings called “breeches buoys;” and self-bailing, self-righting surf boats that the lifesavers rowed out to ships in distress, hence the nickname “surfmen.” The latter role was the most dangerous, since ships tended to need rescuing in the worst weather the Pacific Ocean could muster. 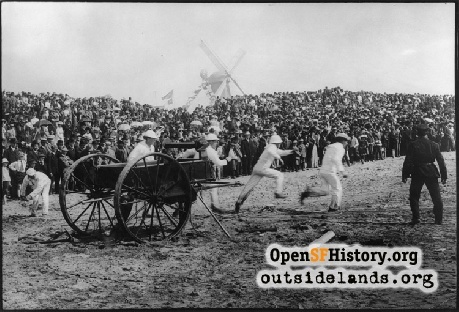 The crews from Golden Gate Park trained frequently on the sands of Ocean Beach opposite the station, drawing huge crowds that watched the dramatic practices. Sometimes the lifesavers rigged a breeches buoy along the beach, using a small cannon to fire a lifeline to a replica ship’s mast set into the sand. Other days, they launched their lifeboats into the surf and rowed out through the breakers, out past Seal Rocks, and then back to the beach. 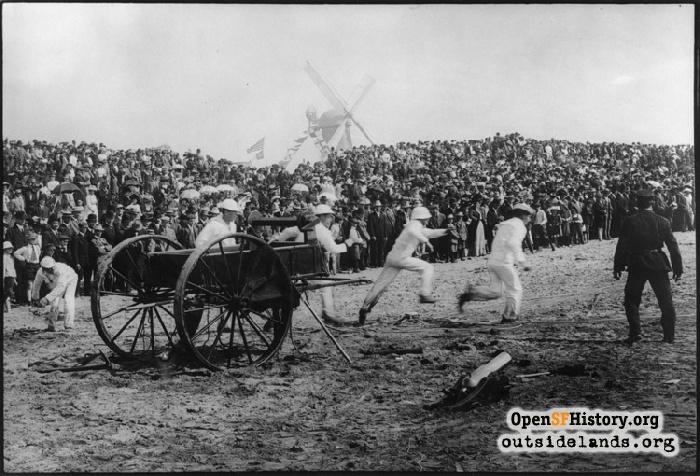 Due to the distance between the station and the surf line, a team of horses hauled the boats on wheeled carts across Great Highway and down a ramp to the sand. The original station buildings were constructed in what might be called U.S. government Victorian architecture, and originally included a Chief Keeper’s residence, lifesavers’ dormitory, boathouse, and various sheds and stables. In 1914, the station became part of the newly created U.S. Coast Guard, but its mission remained unchanged. In the 1920s, the Coast Guard began replacing the aging Victorians with more mundane-looking structures. A former lifesaver name Torleksen purchased one of the 1870s buildings from the government for $75, moved it to a vacant lot at the corner of 47th Avenue and Cabrillo Street, plopped it on a new foundation, and moved in. It’s still there. Surprisingly, the station continued its lifesaving mission through the end of World War II and beyond. By the 1950s, though, improved communications and rescue techniques (think “helicopter”) had made many Coast Guard rescue stations around the country obsolescent. The ten-man crew of Coasties working at Golden Gate Station received orders in October 1951 that they were being reassigned to new duties. According to a story in the San Francisco News, the station’s last day of operation was November 1, 1951. However, the buildings remained in place long after the Coast Guard departed, and although their demolition date is unknown, this author remembers passing the weathered and abandoned buildings through the late 1950s. Perhaps some reader can remember the exact date of their removal? Retired National Park Service ranger and WNP member John Martini is a volunteer helping us process the OpenSFHistory collection. His excellent book on Sutro Baths is available in the WNP Store. Page launched 5 December 2016.